Omega 3 fatty acids (DHA and EPA), these fatty acids are essential. This means that the horse is unable to produce them in the body itself, but has to absorb them with food. This is in contrast with Omega 6, of which there is a lot in the normal ration. BASIC and IMMUNO contain a high concentration of vegetable omega 3 fatty acids (DHA and EPA). These fatty acids are essential. This means that the horse is unable to produce them in the body itself, but has to absorb them with food. This is in contrast with Omega 6, of which there is a lot in the normal ration. Omega 3 fatty acids have numerous functions in the body. Important functions include the inflammation-inhibiting effect and the stabilising influence on the state of mind. 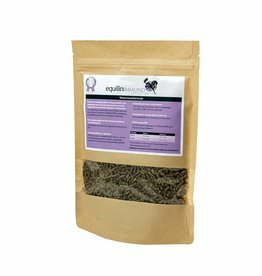 It takes 240 ml of linseed oil to equal the supply of the same amount of Omega 3 fatty acids from the maintenance dosage of EquilinBASIC. This is because the fatty acids from linseed oil (ALA) take a number of steps to be converted into fatty acids that the body can use (DHA and EPA). This process is not efficient, which is why these large amounts are necessary. Supplying linseed oil in addition to EquilinIMMUNO or BASIC is superfluous. If oil is supplied for supplementing energy, saturated oil, such as coco or palm oil, is more suitable for this.